The impetus for this anthem was the Music in Worship event at the 2016 ACDA Southern Division conference in Chattanooga, Tennessee. Conductor Gerald Peel asked me if I would write something that his choir could sing for the event, which was to consist entirely of works featuring the word “alleluia.” In my search for texts, I was surprised to find that the bible actually contains very few usages of the word: it appears only four times in the entire King James Version, and they are all in Revelation chapter 19, from whence the text of Handel’s so-called “Hallelujah Chorus” is derived. Indeed, I decided to use Handel’s text, “Alleluia: for the Lord God omnipotent reigneth,” along with another passage that a friend had suggested to me: Revelation 21:1- 4, about the “New Jerusalem” coming down from heaven. 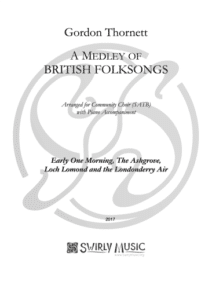 Like many of my compositions, this work is indebted most of all to Ralph Vaughan Williams and is inspired in part by his ‘Sancta Civitas,’ an extended work for chorus and orchestra that features passages from the book of Revelation. My love of J. S. Bach, who also greatly influenced Vaughan Williams’ work, probably accounts in part for the quasi-fugue in the “alleluia” section. The influence of Debussy is no doubt also apparent in the enigmatic, “dreamy” harmonies. I thought this quite appropriate, since John was, in a sense, dreaming when he saw all these things. I hope that this anthem, in reminding us of that dream, will encourage us to never stop dreaming of a better world.